It’s thin and crispy and not too sweet. Granny Smith apples work best and three really big ones weigh about 1 1/2 pounds. You’ll need a 12-inch round pan with a rim (the rim is to keep the edges from burning). A pizza pan with holes works too. For the glaze I use St. Dalfour thick apricot jam. For crust, combine flour, sugar & salt in a bowl. Add oil & milk all at once, stirring with a fork, then form into a ball by hand – dough will be soft & moist. Roll between two sheets of floured wax paper to a rough 12-inch circle. Transfer to an ungreased 12-inch round (rimmed) pan. Press dough towards the rim with your palm to fill pan, making a small raised edge inside the rim. Patch with overhanging pieces. Refrigerate. Peel & cut apples in half. Core and slice them 1/8-inch thick. I cut off the ends and then get about 12 slices per half apple. Cover dough with closely overlapping apples. Tuck all the leftover pieces in to fill any open spots. Sprinkle with sugar. Bake for 45-50 minutes until well browned. Let cool 5 minutes. Gently brush the tart with warmed glaze. 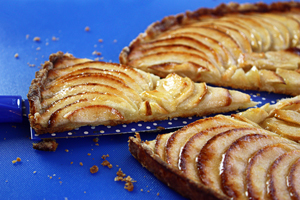 11 Comments on "Crispy Apple Tart"
The crust is only refrigerated while you prepare the apples. Once the tart is baked & glazed, I suggest keeping it stored in the refrigerator until it’s all eaten. How long do I refrigerate it? I have kept my finished tart refrigerated for three days, covered with foil, not plastic. Plastic will make the crust soggy. I have a tart pan 10 inch. Will it be ok for this recipe? That may be a little small for this recipe. If I were using a 10-inch pan I would still roll the dough to a 12-inch circle, fit it into the pan and cut off the extra dough, and I would use medium size apples. Do you have to refrigerate for 3 days? Would it work if I left it for an hour or so? A cooked pie usually takes a few days before it’s all eaten so I always refrigerate it but it’s fine to leave it out for a few hours, as long as it’s refrigerated most of the time. Can I use whole milk? Do you have a video that go with this? No there is no video. Any video I have is always attached to the recipe. Wow!! Making these tomorrow! !! Can’t wait!